The "Skew-T Log P" thermodynamic diagram used for plotting upper air observations. Once the radiosonde observation is plotted, the Skew-T will show the temperature, dew point, and wind speed/direction. From these basic values a wealth of information can be obtained concerning the meteorological condition of the upper air. 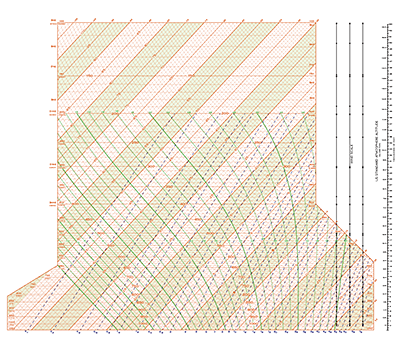 Temperature lines are drawn at a 45° angle with temperature values that increase from the upper left to the lower right corner of the chart. Early versions of this upper air chart were made with the temperature lines drawn in the vertical. But in 1947, the modification of tilting the temperature lines 45° aids in analysis. This is where the name "Skew-T" comes from as the temperature lines are skewed at a 45° angle. Pressure lines are drawn in the horizontal. Distance between the lines increases from the bottom to the top of the chart (1050 millibars) to the top (100 millibars). This is due to the decrease in atmospheric density with increasing elevation (Learn more about atmospheric density). Atmospheric pressure decreases logarithmically with increasing elevation. Therefore the heights of the various pressure levels are plotted as the "log" of the pressure..."Log-P" portion of the Skew-T Log-P diagram. Slightly curved, these lines increase in value (°C) from lower left to upper right. Dry adiabats represent the rate at which UN-saturated air cools as it rises. (Unsaturated air is air with a relative humidity lower than 100%.) As unsaturated air rises, it expands and cools with the temperature decreasing (or lapses) at a rate of 9.8°C per 1000 meters (5.5°F/1000 feet) until the relative humidity becomes 100% (the air becomes saturated). This rate is called the "dry adiabatic lapse rate" and these lines on the Skew-T represent that value. These curved lines increase in value (°C) from left to right. 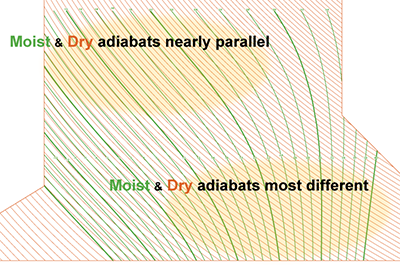 Moist adiabats represent the rate at which saturated air cools (lapses) as it rises. When the air is at 100% relative humidity, further cooling causes water vapor to condense. In this condensation process, heat is released which then affects the rate of cooling and these lines represent that rate. Near the surface, as saturated air rises, it expands and begins to cool at a rate of about 4°C per 1,000 meters (2.2°F/1,000 feet). As it continues to rise, the cooling rate decreases due to a decreasing amount of water vapor. On the Skew-T the dry and wet adiabats become nearly parallel in the upper troposphere where the rate of cooling approaches that of dry adiabats, nearly 9.8°C/1,000 meters (5.5°F/1,000 feet). Very cold air does not contain much water vapor. The reason is because as air cools, the temperature of the water vapor itself decreases leading to an increasing amount vapor condensing to a liquid (or deposits to a solid) state. This condensation and/or deposition decreases the amount of gaseous water remaining in the atmosphere. With very cold air most of the water vapor has already condensed into a liquid or deposited into a solid. The end result is very cold air contains little water vapor and therefore cannot release much heat into the atmosphere. Conversely, very warm air can contain large amounts of water vapor. Warming air means the temperature of the water vapor increases so evaporation and/or sublimation (changing from liquid or solid to a gas) also increases. This adds water vapor to the atmosphere. In the tropics, the large amount of heat released by process of condensation from very moist air is one of the mechanisms for the formation of tropical cyclones and thunderstorms. In meteorology, mixing ratio is the mass of water vapor compared with the mass of dry air. It is expressed in grams per kilogram. Two mixing ratios can be learned from a Skew-T, the ordinary mixing ratio and the saturation mixing ratio. On a plotted radiosonde sounding, the mixing ratio at any given level is the amount of water vapor in the air where the dew point temperature line crosses the mixing ratio line. The saturation mixing ratio is the maximum amount of water vapor that can be in the air at any given level and is found where the temperature line crosses the mixing ratio line. These staffs are for plotting the wind speed and direction as observed by the radiosonde.